John William Polidori (7 September 1795 – 24 August 1821) was an English writer and physician. He is known for his associations with the Romantic movement and credited by some as the creator of the vampire genre of fantasy fiction. His most successful work was the short story "The Vampyre" (1819), the first published modern vampire story. Although originally and erroneously accredited to Lord Byron, both Byron and Polidori affirmed that the story is Polidori's. 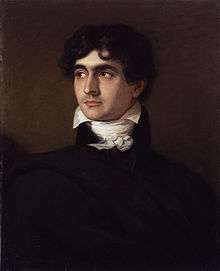 John William Polidori was born on 7 September 1795 in London, the oldest son of Gaetano Polidori, an Italian political émigré scholar, and Anna Maria Pierce, an English governess. He had three brothers and four sisters. His sister, Frances Polidori, married exiled Italian scholar Gabriele Rossetti, and thus John was the uncle of Maria Francesca Rossetti, Dante Gabriel Rossetti, William Michael Rossetti, and Christina Georgina Rossetti, though they were born after his death. William Michael Rossetti published Polidori's journal in 1911. Polidori was one of the earliest pupils at recently established Ampleforth College from 1804, and in 1810, went to the University of Edinburgh, where he wrote a thesis on sleepwalking and received his degree as a doctor of medicine on 1 August 1815, at age 19. In 1816, Dr. Polidori entered Lord Byron's service as his personal physician and accompanied him on a trip through Europe. Publisher John Murray offered Polidori 500 English pounds to keep a diary of their travels, which Polidori's nephew William Michael Rossetti later edited. At the Villa Diodati, a house Byron rented by Lake Geneva in Switzerland, the pair met with Mary Wollstonecraft Godwin, her husband-to-be, Percy Bysshe Shelley, and their companion (Mary's stepsister) Claire Clairmont. One night in June, after the company had read aloud from Fantasmagoriana, a French collection of German horror tales, Byron suggested they each write a ghost story. Percy Bysshe Shelley wrote "A Fragment of a Ghost Story" and wrote down five ghost stories recounted by Matthew Gregory "Monk" Lewis, published posthumously as the Journal at Geneva (including ghost stories) and on return to England, 1816, the journal entries beginning on 18 August 1816. Mary Shelley worked on a tale that would later evolve into Frankenstein. 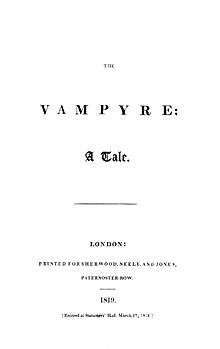 Byron wrote (and quickly abandoned) a fragment of a story, "Fragment of a Novel", about the main character Augustus Darvell, which Polidori used later as the basis for his own tale, "The Vampyre", the first published modern vampire story in English. Dismissed by Byron, Polidori traveled in Italy and then returned to England. His story, "The Vampyre", which featured the main character Lord Ruthven, was published in the April 1819 issue of New Monthly Magazine without his permission. Whilst in London he lived on Great Pulteney Street (in Soho). Much to both his and Byron's chagrin, "The Vampyre" was released as a new work by Byron. Byron even released his own "Fragment of a Novel" in an attempt to clear up the mess, but, for better or worse, "The Vampyre" continued to be attributed to him. Polidori's long, Byron-influenced theological poem The Fall of the Angels was published anonymously in 1821. Polidori died in London on 24 August 1821, weighed down by depression and gambling debts. Despite strong evidence that he committed suicide by means of prussic acid (cyanide), the coroner gave a verdict of death by natural causes. The Vampyre: A Tale (1819) - a text that is "often even cited as almost folkloric sources on vampirism". His sister Charlotte transcribed Polidori's diaries, but censored "peccant passages" and destroyed the original. Based only on the transcription, The Diary of John Polidori was edited by William Michael Rossetti and first published in 1911 by Elkin Mathews (London). Reprints of this book, The diary of Dr. John William Polidori, 1816, relating to Byron, Shelley, etc., was published by Folcroft Library Editions (Folcroft, PA) in 1975, and by Norwood Editions (Norwood, PA) in 1978. A 2009 edition has recently been printed by Cornell University. A memorial plaque on Polidori's home at 38 Great Pulteney Street was unveiled on 15 July 1998 by the Italian Ambassador, Paolo Galli. Multiple films have depicted John Polidori, and the genesis of the Frankenstein and "Vampyre" stories in 1816. Additionally, Polidori's name was used for a character in a television movie adaptation of Mary Shelley's novel: Frankenstein: The True Story (1973), directed by Jack Smight. Polidori appears as one of several minor characters killed off by Frankenstein's creature in Peter Ackroyd's novel The Casebook of Victor Frankenstein. Polidori is a central character in Federico Andahazi's novel The Merciful Women (Las Piadosas in the original Argentine edition). In it, he receives The Vampyre written by the fictional character of Annette Legrand, in exchange for some "favours". Polidori is a prominent character and the catalyst in events in Brooklyn Ann's historical paranormal romance novel, BITE ME, YOUR GRACE. Polidori is a central character in Emmanuel Carrère's novel Gothic Romance (Bravoure in the original French edition), which, amongst other things, presents a fictionalised account of the events of 1816. He appears as a character in Susanna Clarke's novel Jonathan Strange & Mr Norrell. Polidori appears as an enemy of Lord Byron (who is a vampire) in Tom Holland's novel Lord of the Dead. Polidori is also the 'hero' of the novel Imposture (2007) by Benjamin Markovits. Polidori is also the central character in Derek Marlowe's novel A Single Summer With L B, which presents an account (fictionalised) of the summer of 1816. Polidori appears as a minor and unsympathetic character in the Tim Powers' horror novel The Stress of Her Regard (1989), in which Polidori does not write about vampires but becomes directly involved with them. In Powers' sequel (of sorts), Hide Me Among the Graves (2012), Polidori is a vampire and a central villain menacing the novel's protagonists, his nieces and nephews in the Rossetti family. Paul West's novel Lord Byron's Doctor (1989) is a recreation, and ribald fictionalization, of Polidori's diaries. 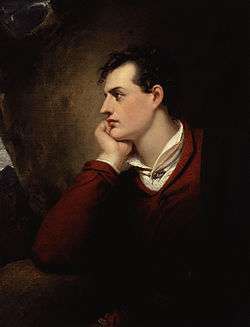 West depicts him as a literary groupie whose attempts to emulate Byron eventually unhinge and destroy him. (2013): P.J. Parker's internationally-acclaimed historic fiction "Fire on the Water: A Companion to Mary Shelley's Frankenstein"
Polidori functions as narrator in John Mueter's one-act opera Everlasting Universe and has a speaking role in several scenes. In the Highlander: The Series episode "The Modern Prometheus", which featured Lord Byron, one of the series regulars, Methos, serves as a stand-in for Polidori. Methos, who was immortal, was Byron's mentor, friend, and physician, and experienced the same events as the real Polidori did on that (in)famous night. In the stop-motion animated series Mary Shelley's Frankenhole, Polidori is a regular character portrayed as the immortal lab assistant of Dr. Victor Frankenstein. Polidori was mentioned in the Tales from the Crypt episode "Ritual". Dr. John Polidori (portrayed by John O'Hurley) was the antagonist of the fifth season The X-Files episode, "The Post-Modern Prometheus". Polidori was also portrayed by Noah McLaughlin in the 2016 web series Ungenial Summer, which fictionalized the events of the summer of 1816 in the modern day. In this version, Polidori serves as a personal assistant to Lord Byron, rather than physician. In the episode of CBBC children's television show Horrible Histories entitled Staggering Storytellers, Polidori was portrayed by Jalaal Hartley in the sketch about the original of his story, The Vampyre and Mary Shelley's (portrayed by Jessica Ransom) story Frankenstein while at Lord Byron's Villa Diodati in Switzerland. Polidori, John William (2009), Rossetti, William Michael, ed., The Diary of Dr. John William Polidori, 1816, relating to Byron, Shelley, etc. :, Cornell, NY: Cornell University Library, ISBN 1-4297-9503-4 . ↑ Jøn, A. Asbjørn (2003). "Vampire Evolution". mETAphor (3): 21. Retrieved 25 November 2015. Nigel Leask, "Polidori, John William (1795–1821)", Oxford Dictionary of National Biography, Oxford University Press, 2004 Retrieved 30 April 2006. Rossetti, William Michael, The Diary of Dr. John William Polidori, Elkin Matthews, 1911 Retrieved 02 October 2015. Frayling, Christopher (1992), Vampyres: Lord Byron to Count Dracula, ISBN 0-571-16792-6 . Carrère, Emmanuel (1984), Bravoure [Gothic Romance], ISBN 0-684-19199-7 . "Polidori, John William". Dictionary of National Biography. London: Smith, Elder & Co. 1885–1900. Project Gutenberg's E-Text of "The Vampyre"
The Polidori Files, archived from the original on 2009-10-27 . The web's first link portal devoted entirely to John William Polidori, author of "The Vampyre". Polidori, John W, The Vampyre (short movie), ES , starring Paul Naschy.